It's that time of year again that the coaching carousel in the world of college football spins around as teams try to find the new man to lead them to greatness. 23 programs have hired themselves a new coach. Who hit a home run or who found a dud? Let's take a look. This was a pretty surprising hire, mostly it came out of left field. After his rough departure, firing, resignation, whatever it was at Auburn, Bowden worked as an analyst before getting the gears back to coaching again. He sent out feelers but ended up taking the job at North Alabama, going 29-10 in three years. It is a risk hiring a guy who has been out of major college football for a long time but unlike Bob Davie, Bowden was coaching at a lower level and did have success when he coached at Auburn and he's been hungry to get back in the mix, so this could actually work out. I don't get how RichRod fell on his face at Michigan, evan as he was thrust into a not great situation and a spread at Michigan was a pretty clear culture shock. He did improve his win totals every year, although not to Michigan expectations. But he is a great fit in Tucson and in the Pac-12, where you see many a spread offense. The only potential downside is that he has never coached in the West really before but he is a big name and a proven offensive guru. ASU's coaching search has been a farce. They offered the job and threw a lot of money at Kevin Sumlin but it fell apart. They apparently offered the job to June Jones but backed off after booster pressure. And now they have their man in Graham, his four team since taking over at Rice in 2006. He lasted a year there, then left for Tulsa a day after signing a contract extension, headed to Pitt, saw the team decline from two wins from the year before and now is at Tempe. I think he's a good coach but will he stay there long-term? Arkansas fans are livid over this decision to name Smith, who served as Arkansas special teams coach from 2009-2011, leaving five months ago to become the head coach of his alma mater, Weber State, as the interim coach for a year because they fail to realize that major names are not going to leave their schools at this point, considering spring football is underway for many programs. For a hire in the interim Smith, who Petrino replaced at Louisville, is not an awful hire considering Smith was a head coach at various schools from 1989 until 2006 when he was fired at Michigan State. Granted Smith showed his coaching shortcomings in East Lansing as his teams got continually worse and look unprepared and undisciplined. I don't hate this hire but I think hiring someone from the current staff, not somebody who did leave five months ago would have made much more sense. Anytime you can get a hotter commodity than the coach that just left is always a good sign and that's clear here. I'm pretty certain that Mississippi would have preferred Malzahn to Jerry Freeze. And Malzahn is taking a nice paycut (from $1.2 million to around $850,000) to head to Jonesboro. Maybe he knows something we don't know but he has had a lot of success in the Natural State before. To get a top assistant on one of the elite programs on the country is always a good idea for a smaller school like CSU. McElwain ran a throwback, pro-style in Alabama and has fielded a Heisman winner and a runner-up. McElwain also has experience out west having served with great success as Fresno State in 2007 and I don't see why he cannot win in Fort Collins. The fiery Pelini (a fiery Pelini? no way) sure has a lot of work to do down in Boca Raton. Howard Schnellenberger built this program from the ground, literally, to make it a decent Sun Belt program at its peak a few years ago but the team has been god awful the last two years. Pelini is a great defensive coach and he's got the energy to tackle this program and bring it up. A pretty good get. DeRuyter has a lot of experience as a assistant out West and in 2010 led a stark turnaround in the Texas A&M defense that was pitiful the year before. But Von Miller graduated and the Aggies' defense really fell off, part of the reason Mike Sherman got the axe. DeRuyter, who has never been a coach before, has a sharp hill to climb in Fresno after Pat Hill's successful tenure as well as severe budget problems in their athletic department. Considering the lengthy amount of success that Chow has had as an offensive assistant, most notably at USC, he has never gotten a head job. And now the native Hawaiian will have a chance to close out his career with a much deserved head job on the islands. The amount of success Chow has had in developing quarterbacks is damn impressive and he'll attack this job with enthusiasm. Levine was named the interim coach for the TicketCity Bowl after Kevin Sumlin departed for Texas A&M. He was one of Sumlin's top assistants and is said to be popular with the players. Now while stability is always a nice thing, Levine has never been a coach or a coordinator before and he will have a lot of work to do this offseason as Case Keenum is graduating after about twenty years it seems. And we've seen hiring popular assistants (Larry Coker, Bill Stewart) may work in the short term, it often doesn't work long term. Well we learned what we already knew about Ron Zook during his tenure in Champaign-Urbana, great recruiter, very mediocre coach. Lots of peaks and valleys in his tenure and eventually he had to go. Beckman has a lot of experience coaching in the midwest and did good work at Toledo over the past three years. This is an odd hire. Without question is Weis a QB guru, he turned Tom Brady into a star, made Matt Cassel look good, and had a lot of success with developing Brady Quinn and Jimmy Clausen at Notre Dame and John Brantley was much improved under his tutelage in Gainesville this year. He also is a solid recruiters and did get Notre Dame to the BCS twice. But the team was very average under him in South Bend overall. You can win in Lawrence, it isn't crazy, but I am not sold Weis is the guy to do it. With the Minutemen moving up to the FBS ranks and joining the MAC, this is an important hire. Granted UMass was not a great FCS program but it could be competitive in the MAC, who knows. Brian Kelly ran the offense in Notre Dame but Molnar has been one of his top lieutenants, has experience as an assistant in the FCS levels as well as experience coaching the MAC, which will be important. Memphis has been a mess over the last few years and it's going to take a lot of work to make it a bowl team. Memphis almost scored a coup with Alabama offensive coordinator Jim McElwain but it fell through and they brought in the youthful Fuente, the co-offensive coordinator of TCU. He's built the Horned Frogs into a pretty potent offense but he is inexperienced and does not have a lot of experience in that part of the country. Freeze did tremendous work his two years at Arkansas State, first as offensive coordinator, second as head coach. And he did coach Michael Oher in high school. But Missisissippi may be the third toughest job in the SEC and Freeze does not have a lot of experience as a head coach at the major college level and two years ago he was coaching the NAIA. Fedora is a heck of an offensive coach and improved the Golden Eagles of Southern Miss every year, culminating in the beatdown upset of Houston in the Conference USA title game. This was probably the best UNC could do considering the probably NCAA sanctions that loom. Before stating the obvious, there is a little bit of downside to this hire. Remember how burned out Meyer was in Florida and the negative affect it had on his health? Could that happen again? That said, this is about as good of a hire you could do. I'll take the risk with Meyer any day of the week. The leadership in State College really took their time with this hire and it wasn't going to be an easy one regardless, considering the situation that rendered it unattractive for the big name targets. That said, this isn't a great hire. We've seen the struggles that assistants of Bill Belichick have had as head coaches both in the pros (Romeo Crennel, Eric Mangini, Josh McDaniels) and in college (Charlie Weis). And while O'Brien has a nice amount of collegiate assistant experience, none of it was done in the Big Ten footprint. But I will grade more favorably because of the aforementioned situation. So Pittsburgh is now on its third head coach of the last year after Mike Haywood was abruptly fired thanks to a domestic violence charge and then Todd Graham departing after only one season for another one of his "dream jobs" at ASU. Maybe they'll find some stability with Chryst. Chryst had a lot of success as offensive coordinator in Madison showing a lot of adaptability to the personnel on the roster. But he has never been a head coach before and does not have a lot of experience coaching in the East. Rutgers came very close susposedly to hiring FIU coach Mario Cristobal, which would have been a great hire. But he chose to stay in University Park, leaving Rutgers to hire Flood, who had been a Greg Schiano assistant since 2005 and with the label of assistant head coach. I don't mind this hire considering the circumstances of Schiano's assistant and what was critical was for the program to best hold together a strong recruiting class. Flood is also said to have the support of the high school coaches across the Garden State. I'm skeptical long-term but for the short-term, this was the best the Scarlet Knights could do after getting spurned by Cristobal. This is the first time the Golden Eagles have had a defensively minded head coach since Curley Hallman left to coach at LSU in 1991. Johnson is regarded as a tremendous defensive coach and has seen a lot of success where he has coached before, which is exclusively in the Southeast. He even had coaching experience at Gardner-Webb and The Citadal and has coached in Mississippi before as an assistant, even under Hallman at USM. The only concern I have is that he is 59. But I really like this hire. Sumlin won a lot of games and scored a whole lot of points at Houston and he is a solid fit in College Station. He coached with the Aggies in 2001-02, had a lot of success as Oklahoma offensive coordinator and has experience coaching in Texas as per his aforementioned tenure in Houston. He'll coach an exciting style of play and should be able to find some success in the SEC. Campbell will be the youngest FBS coach but he has seen success as an assistant in Toledo. His offenses have been consistently explosive under his watch. This is a pretty solid hire for what has been one of the better teams in the MAC over the years as well as one of the most explosive as they won't shake things up drastically since what is in place has worked. Tulane has not been good since Tommy Bowden left for Clemson, the facilities are not very good and LSU takes all of the top recruits and Louisiana Tech has passed the Green Wave. Johnson has never coached nor coordinated before but he does have a strong record of coaching wideouts in college (Andre Johnson, Reggie Wayne, Santana Moss) and with the Saints (Marques Colston, Robert Meachem, etc). He did coach with the Saints of late but we've seen position coaches without coordinating experience not do too well. Once again, the Blazers hire an SEC offensive coordinator, which they did in their prior hiring of Neil Callaway, who was Georgia offensive coordinator. And once again, UAB has hired an offensive coordinator that is not in complete control of the offense, as clearly Bobby Petrino ran the offense in Fayetteville. McGee has coached good quarterbacks and is regarded as a solid recruiter but history has a tendency to repeat itself. Now I know that UCLA is not as good of a program as it should be. Yes it's in a great recruiting hotbed but it always has been second to USC, the facilities are not very good, the Rose Bowl is over 30 miles from campus and the budget for assistant coaches is not very much at all. That said, they really settled for an NFL retread whose any college coaching experience was as a graduate assistant at Washington in 1985? Mora was not that good of an NFL coach and we've seen so many NFL retreads fail in college. Maybe he could be Pete Carroll but I wouldn't count on it. 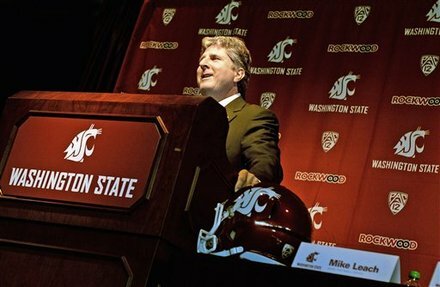 This is the absolute perfect fit for Leach. A big school was not going to hire Leach due to his baggage and this is a very similar situation to when he was hired at Texas Tech, two isolated programs out in the middle of nowhere that have had some success but never sustainable. Leach has some pieces to build on and will have this team bowling next year and down the road in the Rose Bowl. 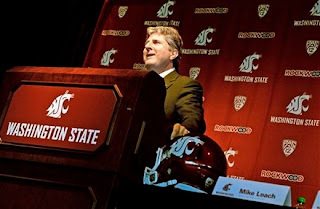 If Mike Price can do it, why not Leach? Who's to Blame for the Jets' Locker Room Mess? Did Jerry Angelo Deserve To Be Fired?